Today’s traditional manufacturing supply chains must evolve into tomorrow’s advanced manufacturing enterprises to succeed in the global marketplace. This will require new supply chain tools and insights to overcome intense competition. 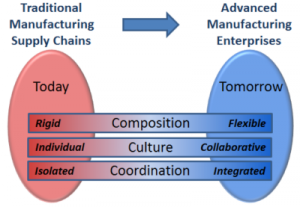 Now, more than ever, the companies that can best design, assemble and coordinate their advanced manufacturing enterprises will have a tremendous competitive advantage. The Lucrum Group focuses on just that—the business processes of designing, assembling and coordinating your advanced manufacturing enterprise. Properly addressing these key processes becomes even more critical as the product technical requirements increase in complexity. Our work can help manufacturers in industries such as aerospace, defense, energy and medical devices better plan and coordinate supply chain activities despite disparate tools and processes. This approach allows The Lucrum Group to deliver solutions that directly improve your bottom line and help keep your customers happy. All solutions are tailored to our client’s needs. Below are some of the general challenges we can tackle for you. Solutions adoption—increasing return by driving adoption.